Can you confirm these amateur observations of Phoboscincus garnieri? Types Neotype: BMNH 60.3.18.18, purchased by H. Cuming; designated by Sadlier (1987). Holotype not in MNHN, but listed by Brygoo 1985. Comment Uncommon and restricted to a few localities. Behavior: Appears to be extremely secretive. Ineich I 2009. 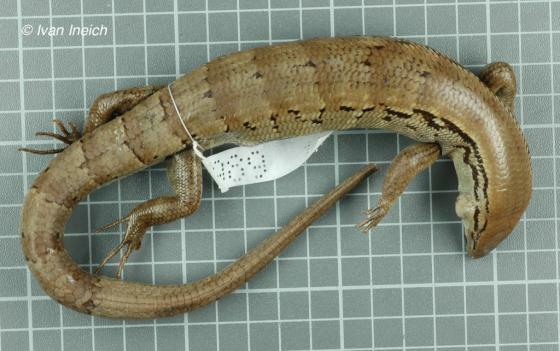 Bocourt’s Terrific Skink, Phoboscincus bocourti Brocchi, 1876 (Squamata, Scincidae, Lygosominae), in GraNdCoLaS P. (ed. ), Zoologia Neocaledonica 7. Biodiversity studies in New Caledonia. Mémoires du Muséum national d’Histoire naturelle 198: 149-174. Paris, ISBN: <br />978-2-85653-618-6.